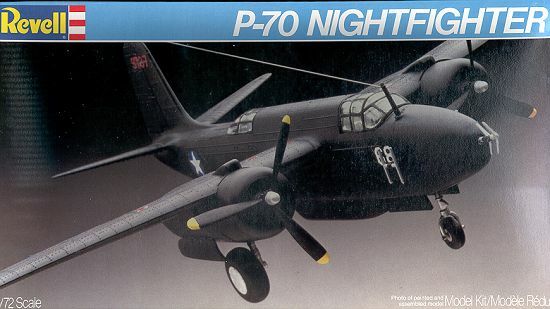 If you think about US WW2 nightfighters, your thoughts will undoubtedly not turn to the P-70. It was definitely a stop-gap measure to try to do something about the night intruders over Guadalcanal and other Pacific island. The Japanese were constantly sending over night raiders to bomb and generally tick off troops. Several attempts were tried with single-engined aircraft with some success, but what was really needed was a dedicated night fighter. The A-20 was in production and of sufficient speed and size to carry the needed crew and equipment. However, it was severely limited in altitude so the intruding Betty bombers merely had to bomb from an altitude higher than what the P-70 could reach. P-70 performance was pathetic at any altitude above 20,000 feet. Its real strength was 10,000 feet or below, where it was highly maneuverable, in many cases being able to succeed in dogfights with P-47s. However the truth was that Japanese aircraft were often faster than the P-70 at high altitude (assuming the P-70 could get there and simply outran it. To get a kill in the P-70 was truly a feat of piloting skill and tactics unless the intruder was foolish enough to get down to the P-70s fighting altitude below 15,000 feet! The most successful of the night fighting outfits was the 6th Night Fighter Squadron, which had detachments on Guadalcanal and in New Guinea. It was followed by the 418th 419th and 421st NFS. They flew a combination of P-70s and P-38, with the P-38s doing the high altitude work in conjunction with searchlights. These units stayed with this combination until mid-1944 when their trusty aircraft were replaced by the superlative P-61 Black Widow. However, it was the P-70 that gave crews the year's worth of experience needed to do so well with the Black Widow. 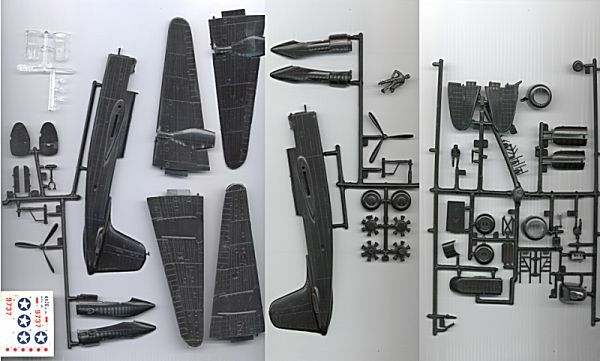 Revell's kit of the P-70 is merely their A-20 Havoc kit with a few extra bits to make the night fighter version; basically the nose and underfuselage gun pod. In order to save us from having to paint the kit it is molded in black. Even though this is the 1982 boxing of the kit, it still has its late '60s traits. In this case it is minimal cockpit detail and maximum rivet detail. All the detailing on this kit, with the exception of the control surfaces and bomb bay doors is raised. A good treatment with sandpaper should take care of the exaggerated rivet detail. The cockpit section includes a floor, bulkhead, seat and control stick. The aft compartment is just a bulkhead. There are crew members for these locales. I doubt if there are any aftermarket parts to spruce up this kit, though some would be quite welcome!! The landing gear are quite adequate, but must be installed when the fuselage or nacelles are glued together, an invitation to snap them off during construction. As one might think, there is no wheel well detail, in fact there is no wheel well per se and if you want one, you have to make one. The engines are just generic two row radials, though the kit is designed so that you can pose them with cowls off. There is a ground crewman and work platform included for the diorama folks. The decal sheet contains just numbers and roundels. The P-70 has not been at all assisted by aftermarket decal sheets, so you are on your own in this regard. If I recall the A-20, this is not that bad a kit to construct, despite being so dated. As much as I would rather build another kit, this is the only P-70 in 1/72 and so is needed for my 'P-1 to F-117' Air Force fighter collection.